What Is a Segway® PT? i2_Commuter_72The Segway® Personal Transporter (PT) is the first of its kind – a self-balancing personal transportation machine designed to go anywhere you go. 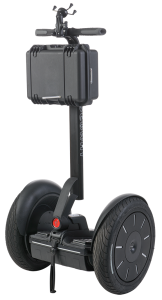 With its innovative technology, the Segway PT carries you across most terrains noiselessly and efficiently while producing no adverse environmental emissions. It’s easy and fun to operate. All you have to do is lean in the direction you want to go, and your Segway PT takes you there. And don’t worry, it takes care of the balancing-on-two-wheels part.